One of my favorite things to order at Mexican or Southwestern restaurants is chicken tortilla soup – I love the combination of savory, rich flavors paired with wonderfully fresh ingredients. However, until recently, I had never made it at home. I had a major hankering for it the other day, but wasn’t in the mood to go out to a restaurant, so it was time to give a homemade version a try. Conveniently, a local restaurant, Mas Tacos Por Favor, was recently written up in Bon Appetit, + had provided the recipe for their super-popular chicken tortilla soup, so I gathered up all the ingredients, + set about making it. 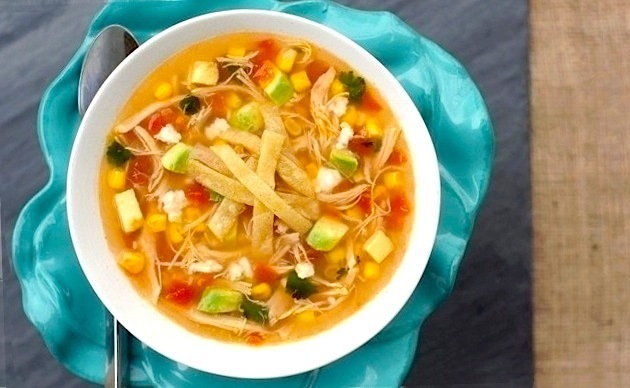 This soup turned out absolutely AMAZING – it truly is the tastiest chicken tortilla soup I’ve ever had. It does take a couple hours’-worth of cooking, but it’s completely worth the time. The scratch-made broth is the star of the dish – amazingly savory + full of flavor, with a wonderful spicy bite from the dried chiles. The tender shredded chicken, the sweet charred corn + the tangy queso fresco work beautifully against the rich avocado, the bite of the tomatoes, + the crunch of tortilla strips. Plus, this recipe makes quite a bit of soup, + like most soups/stews, the leftovers get even tastier after a day in the fridge. I will absolutely be making this amazing soup again soon! Bring chicken, onion, carrot, garlic, chipotles, jalapeño, and 16 cups water to a boil in a large pot; skim foam from surface. Reduce heat to medium and simmer, skimming the surface frequently, until chicken is cooked through, about 1 hour. Transfer chicken to a plate. Strain broth into another large pot. Return chiles to broth, if a spicier broth is desired; discard remaining solids. Shred chicken meat; discard skin and bones. Transfer chicken meat to a medium bowl and set aside. Meanwhile, set pot with strained broth over medium heat and add cilantro sprigs. Bring broth to a simmer; cook until reduced to 8 cups, about 1 hour. Discard sprigs and chiles, if using. Stir in 3 Tbsp. lime juice. Season with salt, pepper, and more lime juice, if desired. Add chicken to broth. DO AHEAD: Can be made 2 days ahead. Chill until cold, then cover and keep chilled. Attach deep-fry thermometer to the side of a large cast-iron skillet or other heavy skillet. Pour oil into skillet to a depth of 1″. Heat over medium heat until thermometer registers 350°–360°. Working in batches, fry tortilla strips, turning occasionally, until crisp and golden brown, 2–3 minutes per batch. Using a slotted spoon, transfer to paper towels to drain. Season with salt. Rewarm broth with chicken. Divide soup among bowls. Top generously with corn, tortilla strips, cilantro, tomatoes, avocado, and crumbled queso fresco. I love tortilla soup, it is one of my favorites. Homemade soups are always the best, yours look perfect. thank you so much, dawn – i so appreciate your kind words! Amy, this soup looks perfect for a chilly day! I’d love to try it for myself. What an easy recipe, too! Thanks for sharing. 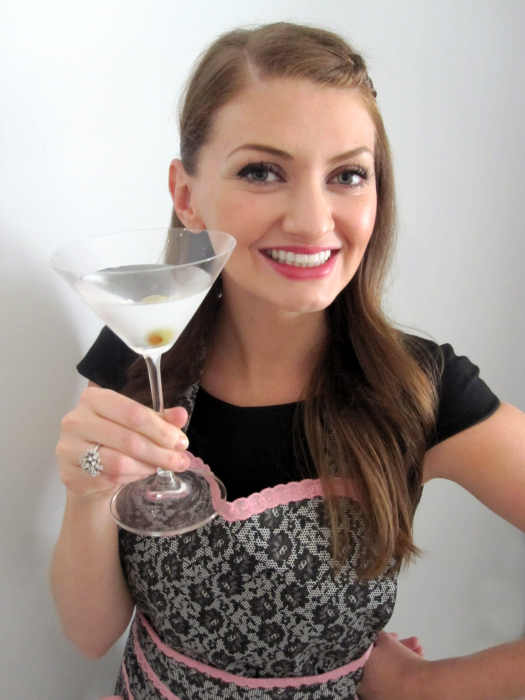 You have a great blog and I’m happy to have found you! I have a similar chicken tortilla soup recipe, but with black beans in it! i thought about adding black beans into it, but didn’t at the last minute. i’ll have to give that twist a try next time! this looks delicious! perfect for the fleeting winter I have a cheesy chicken tortilla soup recipe, but I love that this one is a bit lighter! Yum! thanks, rachel! i find that some of the cheesier recipes can be a bit heavy for me, so i loved the lightness of this recipe, too. hope you love it if you try it! One of my all time favorite comfort foods. Love your pics.